I was so waiting to post this Xtra Special Kobbari Obittu Recipe. I am sure you are wondering why I was so eager to post this and why this is extra special! A long while ago,when I was a kid, mom took part in a cookery contest in one of the magazines where innovation was the key. She came up with a recipe and sent it across. Since it was a written recipes contest, the magazine tests the recipes and then declared the winners. Mom won the first prize and the recipe was published in the magazine as well! And that dear friends is why this recipe is xtra special. She has told me this recipe several times and each time I would want to make it but somehow it never got done. 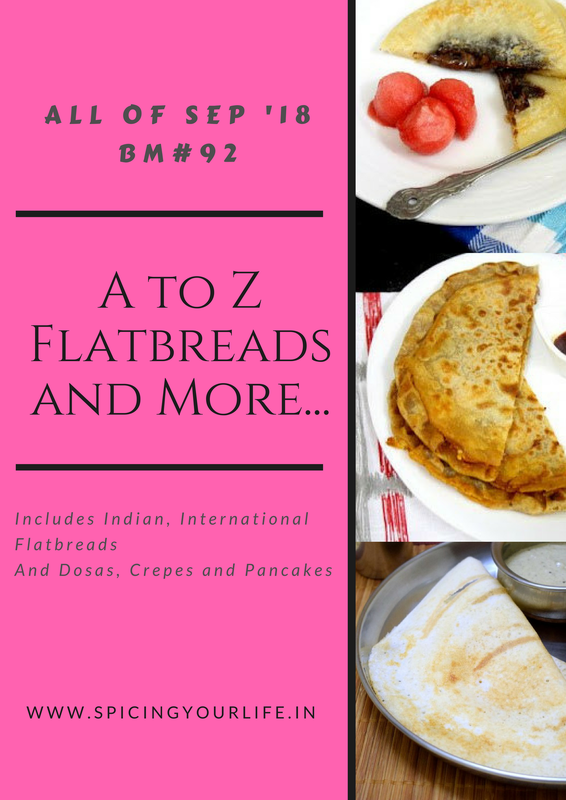 Finally when I was looking for something to be posted for the alphabet X in the A- z flatbread series, I thought this one would be very apt for the alphabet! This is a obittu recipe.Obittu is a sweet flatbread from Karnataka and the filling here is dried coconut / kobbari , poppy seeds, roasted chana dal and jaggery. It is a very different filling from the usual boiled channa dal-jaggery mixture. So here is mom’s prize winning recipe…. Dry roast the poppy seeds, roasted channa dal individually and transfer onto a plate. Similarly, dry roast the dried coconut till it turns light brown and transfer it into the same plate. Let the ingredients cool . Take this in a mixie jar and add jaggery and powder the ingredients. Transfer into a bowl and keep aside. Take wheat flour , a little salt in a bowl and mix well. Add water little by little and knead to a smooth non sticky dough. Add a little oil and knead once more for a few more minutes. Pinch out a small ball of dough and flatten it a little. Place a tablespoon of filling on the flattened dough and bring the edges together. Roll out into circles. It should not be too thick. Cook on both sides till brown spots appear. Remove from heat and repeat for the remaining dough. For the outer covering - Take wheat flour , a little salt in a bowl and mix well.Add water little by little and knead to a smooth non sticky dough. Add a little oil and knead once more for a few more minutes. Wow! PJ! Congratulations to your mom for this superb idea for obbattu filling. I am going to try this out next time. Congratulations to your mom ! Yes it might be years back but I must say winning in those days was different . The recipe sounds like a keeper recipe and a very delicious one . One more added to my bookmark list . Congratulations to your mom PJ! Now we know where your creativity in recipes comes from. That’s truly an XXtra special dish. It looks so tempting and fabulous!! Thats awesome, congrats to ur mom. And the kobbari filling is truly tremendous. Xtra special kobbari obittu is definitely a delightful dish. Love to have some..
Wow.. one more sweet recipe… love your version of obittu… so perfectly done. That is surely an xtra special recipe. Congratulations to your mom. The filling is quite innovative and must taste absolutely yum. This filling surely sounds fantastic and so nice to know your mom winning with this recipe. Surely worth all the wait yaar and sharing it now making it Xtra special for us too.. Your mum must be so proud that you finally made her recipe. It definitely is so different from the usual lentil and jaggery filling. Lovely recipe Padmajha. Wow loved the reason behind the name. It is really quite different yet so flavourful roti. And yes congratulations to your mom .